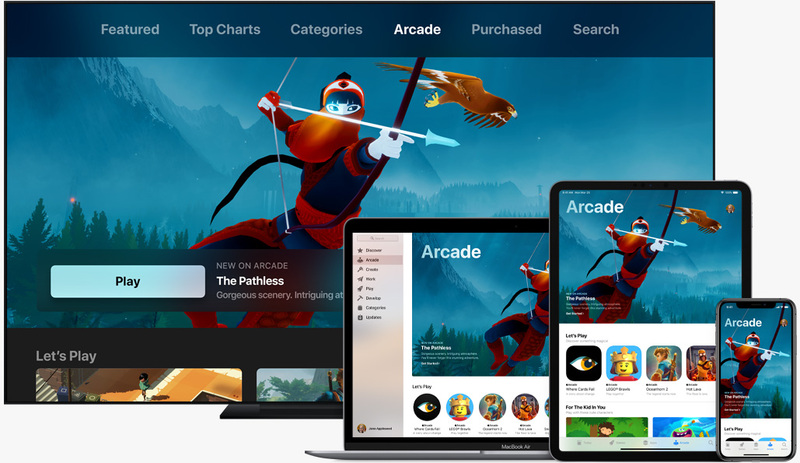 Today during its big press event, Apple announced Apple Arcade. Arcade is a new subscription service that provides access to a planned library of premium titles. You pay a single price, and you can download all of the games for free. None of the titles will have additional ads or microtransactions. And these games aren't streaming; you download them from the Apple App Store like normal and they can be played offline. It's launching this fall on iOS devices, but like Apple TV+, there was no price given for the subscription. Compared to last week's announcement of Google Stadia, it feels a bit more put together. A single price gets you access to an entire library of games, playable across your iPhone, iPad, Mac, and Apple TV. It's Humble Monthly or Xbox Game Pass for iOS, which is a good idea that I'm surprised didn't exist before now. I could see myself using it. Better yet, Apple is also reaching into its coffers to fund several projects from independent developers. Final Fantasy creator Hironobu Sakaguchi is working on Fantasian, Revolution Software is finally offering a sequel to Beneath a Steel Sky, and other indies like The Pathless and Where Cards Fall are getting a big shot. That's fantastic. More resources for independent developers creating new experiences is excellent, so I'm going to give Apple praise for that. There are a few problems once you think about it a little more. Discoverability is a huge problem on the App Store, and has been for some time. There are just too many games coming out each day to make heads or tails of anything. That means the only way to stand out is to hit one of the charts, or get a feature promo from the App Store. Apple Arcade seems to be a solution for that problem in particular, and I can guarantee that those feature promos will go to games in Apple Arcade first before anything else. That's pretty normal for a platform holder, but with the App Store, you're talking about a reach of "1 billion gaming customers." The difference between no promo and promo is life or death. Then there's how Apple will be paying its creators. According to a story by VentureBeat, Apple is splitting the subscription fee for the service among the developers based on time spent playing each game. This is a horrible metric. Platform and business model determines how a game will be designed. Free-to-play games operate a specific way as a result of free-to-play business models working very well with customers on mobile platforms or Facebook. Current games on iOS and Android devices are designed to maximize the mindshare of users on those platforms, because that's how they'll make money. The first wave of Apple Arcade games might be pure, but the second, third, and fourth waves? Aiming to get some of the service fee when there are 100 games is one thing, but what about when there are 300 or 500 or 1,000? Developers will start designing to ensure that players stick with a game for a long time in order to grab that service fee money. Humble Monthly and Xbox Game Pass get around this issue because the games are also available through other means. Crackdown 3 is a Game Pass title, but you can buy it on Xbox One for however much a retailer is charging. The current Humble Monthly includes Northgard, Minit, Mutant Year Zero: Road to Eden, and Absolver: Downfall, all of which are readily available elsewhere. Some of the Apple Arcade titles operate in the same way, with Overland and The Pathless already coming to platforms like Steam, PlayStation 4, and Xbox One. This issue is more about what happens to iOS exclusives as Arcade gets older and larger. Apple hasn't entirely been the best store operator either, as its curation efforts can be spotty. The company delisted Sweatshop HD, a game pointing towards the real issues of sweatshops, from the App Store because it was uncomfortable selling a game about sweatshops. Apple itself sources from suppliers like Foxconn, who have been hit for sweatshop-style labor practices. There's Endgame: Syria, a game meant to tackle the realities of the Syrian Civil War. You can also count Civil War: 1863 and Ultimate General: Gettysburg, both strategy titles about the United States' own Civil War; both were banned because of the flag of the Confederate States of America. Apple owns the hardware and the software. It takes a cut of every purchase (and a further cut if you pay with the new Apple Card!). And it can decide which games live and die on its platform. Apple Arcade is going to be great for a select few. Those chosen developers get to have courtside or box seats to the big game, while everyone else gets nosebleed seats, or watches on their phones outside of the stadium. There's always money to be made in gaming. It's a billion dollar industry and one of the premier forms of entertainment. And like last week's announcement of Stadia or today's announcements of Apple News+ and Apple TV+, Apple Arcade is a platform holder trying to get in there and become the middleman. This will have some great benefits for a select few. My mind is already looking forward to the developers who will be enabled with Apple's resources and promotion, but my gut is thinking about the current state of the App Store and many iOS games. And that's the major problem rooting around in the back of my thoughts. All the issues you have with the App Store and iOS games? Discoverability, the horde of clones, general IP theft, and the misguided content curation? Apple had a hand in creating them or simply decided not to fix them. Imagine a benevolent landowner with some prime real estate. You let people make stores and businesses on your land. When the infrastructure breaks down, you fix nothing. When the broken windows stack up, you turn a blind eye. Instead, you create a new gated neighborhood within the old one. And then you charge for access for that. That's Apple Arcade—fix for a problem Apple created. Tagged with apple,	Apple Arcade,	Indie,	iPads,	iPhones,	Macs,	Opinions.